One of the first images I pinned to my nail Pinterest board was a pictorial for simple but adorable layered hearts nails from The Beauty Department. I kept putting it off forever, but I finally did it! Because my repin originally did not have a proper source (found out it was TBD later with some Googling), I actually did this going only by the pictorial and not the instructions; I see some imperfections that probably could have been avoided if I had found the post first! 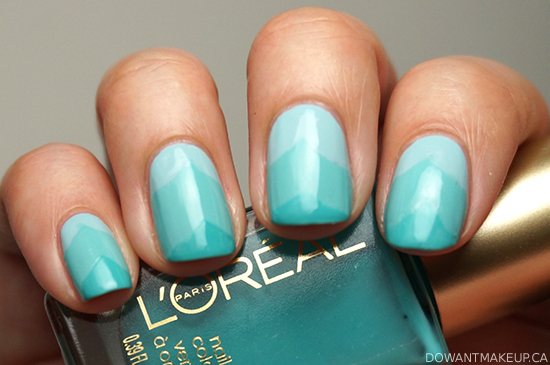 Little finger is a base colour of butter London Slapper, then Orly Ancient Jade and Orly Dazzle layered over top. Other fingers are the same except I swapped Orly Dazzle for Orly Jealous, Much? Here's attempt #2. The shades are a little more matchy here, with a base of China Glaze Kinetic Candy then layers of China Glaze For Audrey and L'Oreal Colour Riche Not A Cloud in Sight. 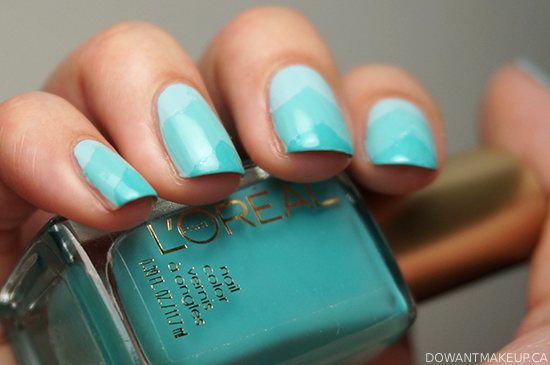 I love the really calm blue tones in this mani. If you're wanting to try this for yourself (and are in the Greater Vancouver area), come see me this weekend June 22-23 at Metropolis at Metrotown mall in Burnaby! I will be there with fellow bloggers Lindsay of Lindsay Windecker, Winnie of The Rawr Shop, Jayne of Cosmetic Proof, and Dee of Deez Nails to help participants tackle this look and two others over the next three weekends. 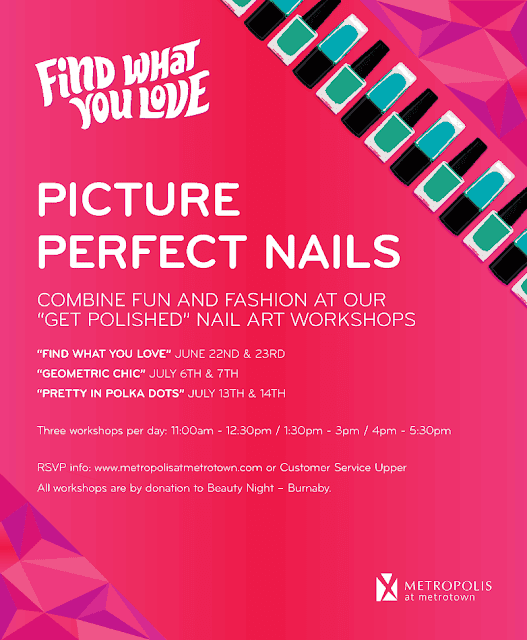 Details: there are a total of six 90-minute workshops this weekend to help you get a perfect layered hearts mani using circle reinforcements. The second weekend is geometric nails using tape, and the weekend after that is polka dots with paper clips (I won't be at this one myself though). Among other goodies, participants will get their own nail polish minis to complete the look and keep after the workshop. All of the workshops are by donation with proceeds going to Beauty Night, an organization that provides many services including wellness programs and makeovers to women in shelters and health care facilities. It's an all-around win-win for everybody! I'm super excited to be a part of this event and to work with some seriously talented nail bloggers. I hope to see you this weekend :D If you have any questions about the event, please don't hesitate to get in touch with me via the Contact tab above or on Twitter at @dowantmakeup.